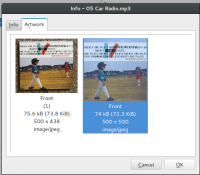 Picard displays complete cover arts in Info dialog. But after a track has been tagged (i.e. one selects a file, perform a lookup, file moves to right panel), and one opens up the Info dialog, only new covers are shown. It would be better if it could display both existing and new covers after tagging, and allow the user to compare them side by side.